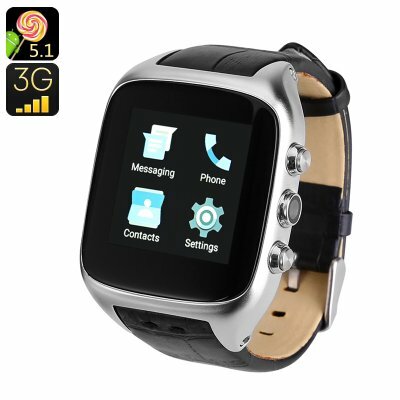 Successfully Added Android 3G Watch Phone - Android 5.1, 1GB RAM, 3G, Wi-Fi, 1.54 Inch Touch Screen, IP65, 3MP Camera (Silver) to your Shopping Cart. The perfect combination of function, portability and form, it is an IP65 rated smart watch comes with SIM card support so it is a standalone watch phone that can be worn right on your wrist. With its fashionable business like design and IP65 rating this square faced wristwatch is as much at home in the boardroom as it is on the beach. It's water proof and dust tight case ensure great protection so it can accompany you places where your phone can't go and lets you travel light when you want to keep all the main features of a smart phone without the restrictions. This watch phones 1.54 inch display brings a compact but perfectly sized interface allowing you to scroll between apps, With an Android 5.1 interact there are plenty of options when it comes to adding extra apps with a huge range available from the Google play store. Whether is navigation apps, health and fitness tracking or some fun games to keep you entertained on the go this mini smart phone watch has it all. As well as the touch screen interface there are two buttons to help in navigations and between them a discreet 3.0MP camera that will lets you snap pictures without being noticed, just like a special agent. With its single SIM card slot you can connect to 2G + 3G networks with GSM 850/900/1800/1900MHz, WCDMA 2100/1900MHz frequencies supported. Added to that the Wi-Fi module and you can surf the web with ease. A built in 600mAh battery brings you plenty of power making this Outdoor Sports watch a winner for tracking your position and keeping you connected while on the go without weighing you down. The sports smart watch comes with 12 months warranty, brought to you by the leader in electronic devices as well as wholesale watch phones..
Arabic: - مشاهدة الروبوت الهاتف - Chinese Simplified: - 安卓手表手机 - Czech: - Android hodinky s telefonem - Dutch: - Android horlogetelefoon - French: - Montre Android téléphone - German: - Android Handy - Hebrew: - שעון אנדרואיד טלפון - Hindi: - एंड्रॉयड देखो फोन - Hungarian: - Android néz telefon - Italian: - Orologio Android Phone - Japanese: - アンドロイド時計電話 - Korean: - 안 드 로이드 시계 휴대 전화 - Malay: - Android Watch telefon - Norwegian Bokmål: - Android ur telefon - Romanian: - Android ceas telefon - Russian: - Android Смотреть Телефон - Spanish: - Android reloj teléfono - Thai: - นาฬิกา android โทรศัพท์ - Turkish: - Android seyretmek telefon - Vietnamese: - Android Watch điện thoại.